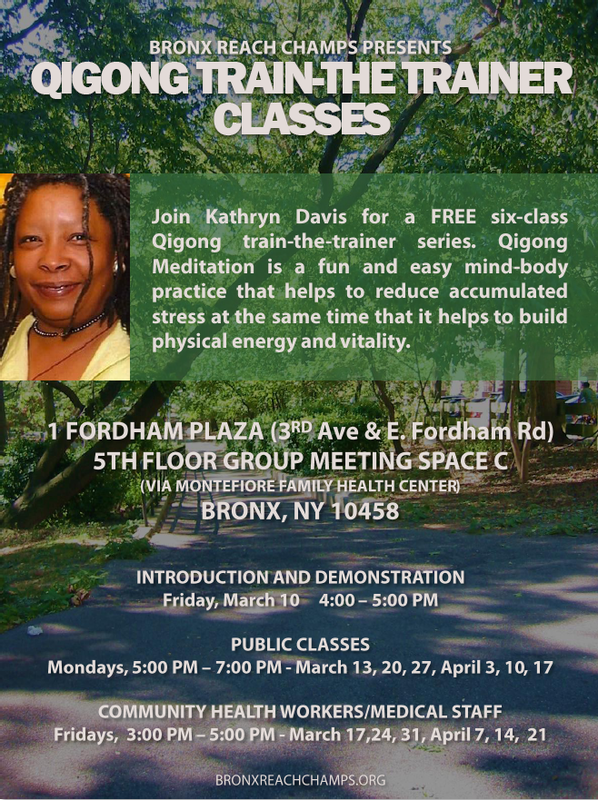 Bronx Community Health Network (BCHN) is pleased to announce the Bronx REACH CHAMPS FREE Train-the-Trainer series on Qigong Relaxation Techniques with Kathryn Davis. There will be two training series: one on Mondays and one on Fridays in March and April 2017 for the public, community health workers and medical staff. Qigong relaxation techniques are fun and easy mind-body practice that help to reduce accumulated stress at the same time that it helps to build physical and energy and vitality. All workshops will take place at 1 Fordham Plaza, in the 5th floor Group Meeting Space C, via Montefiore Family Health Center, Bronx, NY 10458. The building is located on the corner of Third Avenue and East Fordham Road, across the street from Fordham University. You will need to show ID to enter the building. For transportation, take the D or B train to the Fordham Road stop, Bronx 15, BX 41 and Bee Line 60/61 buses to Fordham Plaza, or the Metro-North Harlem line to the Fordham stop. You will need to wear comfortable clothing and bring an exercise mat.